ODCA Venezuela: The war at home: Chavez against Venezuela? The war at home: Chavez against Venezuela? I am not too sure whether some war actions are actually taking place on the Colombian border, but the war at home is certainly growing. Let's first start with the general mood, splendidly given by this Weil cartoon which was the front page of Tal Cual. Because thsi is the real mood here, the real war, how to find ALL the basic food staples that you need and that are imported in increasing amounts. A couple of mines dropped by Colombia in front of Puerto Cabello and La Guaira and in a few weeks we are all starving. Because this is what keeping people awake at night, what line will they have to take to find X, what hospital will be able to handle situation Y, how they need to hide their cash and cell phone when they go around doing these activities (hospitals by the way are racked by common crime as patients lose everything if left alone for the night while doctors get mugged during their rounds). And let's not talk about the degradation of school quality, job quality, everyday life quality, things that cannot in any possible way get better through a war with Colombia. WE ALL KNOW THAT and that is why Chavez is seen as increasingly alone on this matter except for the red shirted flapping seals that surround his circus. Elides Rojas, the director of El Universal, (HT C.) wonders openly about who will be distributing chicken and food stuff if soldiers are at the border; and how officers war on cholesterol and triglycerides will prepare them to fight against Colombia. It is supposedly a humorous piece but in fact it reads as a searing indictment of the Venezuelan army. 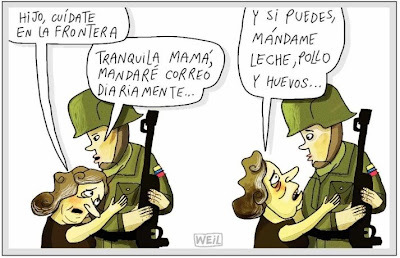 And the Tal Cual editorial that accompanies the cartoon is yet another indictment as its veiled implication is whether Chavez is in fact doing war on us, taking the opportunity to purge once again his entourage. It should be noted that as this typing, I am not aware of any new defensive measure that Colombia might have taken. Uribe knows very well that Chavez will not dare attack and that soon frontier circulation will start again as Venezuela will cry "uncle" without Colombia firing a shot. That the head of state sings, dances, insults or brags on television may be objectionable or laughable, as you see fit, but it is ultimately inoffensive and inconsequential. However it has never happened and should not be tolerated that an entire nation is to be put on alert, ordered to mobilize troops and nearly putting Venezuela on a war footing, through "Alo, Presidente". This time Chavez went too far. To take such a decision and made to hip-hop dance in front of the cameras does not prove anything other than a supreme irresponsibility on the part of those who govern us today. The former defense minister, Raul Isaias Baduel, has arguments when he notes that Chavez interference in a matter that does not concern us directly and provoke the Colombian government to respond to his verbal attacks and military threats, is none other than one evil attempt to mount a media show. The president intends to convert the Colombian government in the "enemy" because it desperately needs to appeal to nationalism to divert attention from Venezuelans from the real and urgent domestic problems and seeks to bring all together around him, as a figure of power. But that formula, as Baduel said, does not work. First, because Chavez is no longer the messianic leader of the past to the masses who followed blindly. Second, because the idea of Colombia, the most brotherly of our neighboring countries, as a real threat and potential aggressor was discarded after the Bogota government reaffirmed its commitment to peaceful means and announced that it would not mobilize troops. In this race messianic to promote conflict at any cost, Foreign Minister Nicolas Maduro chimed from the AN that the operation carried out the weekend against the FARC in Colombia equatorial soil was actually scheduled to be held in Venezuela in September 2007. That same night, Minister of the Interior, Ramón Rodríguez Chacín, told the joke of the laptop left by the murderers of Wilber Varela (aka Jabon) next to his body, so that the Venezuelan authorities could, a month later denounce connections the narco with Colombian officials. Silliness of this magnitude is conceivable only in the head of Rodríguez Chacín, an official with "impeccable credentials and operational military "from the slaughter of Amparo and who on political issues is a functional illiterate. Chavez meanwhile, watches from the stands the show that he mounted and keeps a prudent silence. For all practical purposes, even after the stupid communique of last night, the war is over, the one at home is just starting.